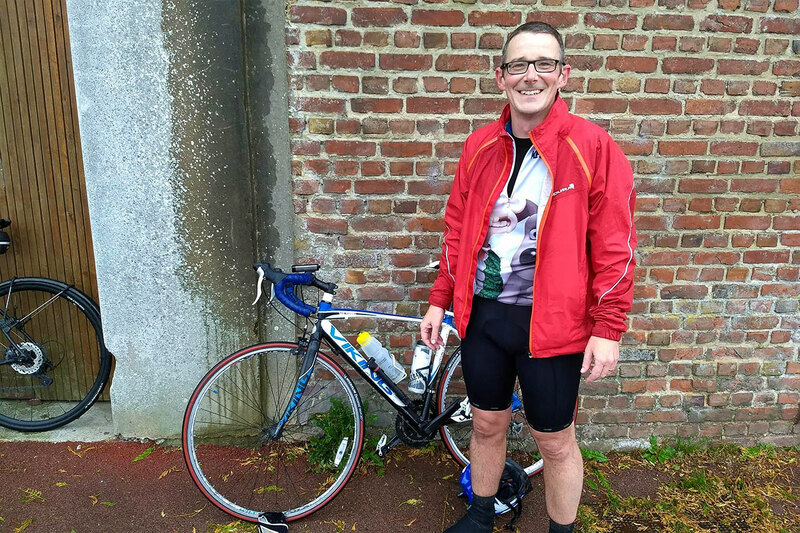 Last years effort to ride around the Pas de Calais left us with some unfinished business. Maybe you remember my write up? Mark and I and Nineteen Dogs around Desvres ended 7 miles short of a 100 miles and a flat car battery stopped us getting our evening meal in Boulogne. This year we thought we’d return for round two with a slightly more polished plan (and a new car battery). Mark has still not ridden 100 miles in one ride and since it’s always nice to have riding company we extended a cautious invite to see if anyone would join us. The understanding was that the days’ effort was not intended to be a roadtrain. JohnR and Ian (a work colleague) were up for the adventure which made four of us travelling in two cars. 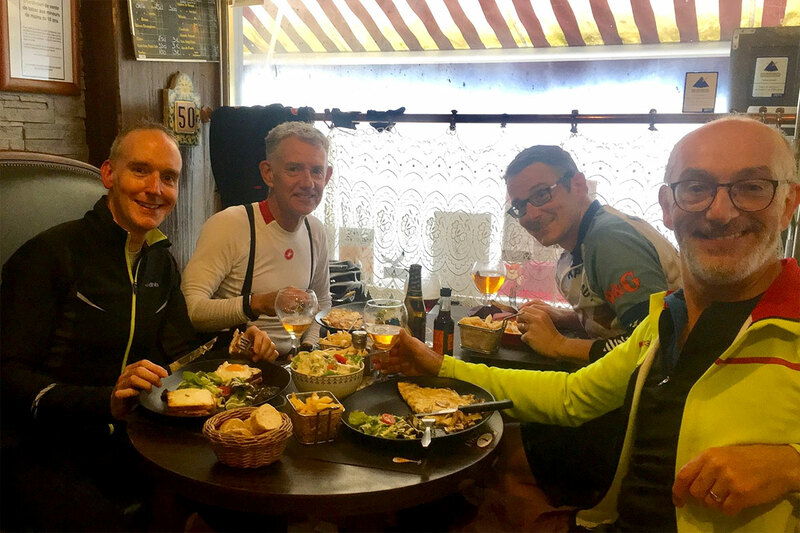 The idea was to complete an extended route of 110 miles, spend the night at the Ibis in Boulogne and indulge in some vin rouge, steak and frites in a nice restaurent. Our return would be the following day, after breakfast and a leisurely morning in the town. What could possibly go wrong? Well let’s start with the Tunnel shall we? I’ve always rated the Eurotunnel service for its quick and easy ability to get you into France with the minimum of fuss. However this summer there was all sorts of trouble as the service struggled to cope in the 30° temperatures and our family holiday in August was delayed as we travelled both to and from France. This time round, things appeared to be all set us for us to catch the 6:20 crossing which would get us to our start point and ready to ride by 8:30 (UK time). We drove onto the train in high spirits – if slightly bleary-eyed – and sat waiting for the off. And waiting… and waiting. 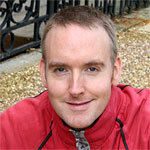 Light relief only came when I chose to swap into my cycle clothing using my Modesty Smock™ to save my blushes. I carefully concealed what I wanted to conceal while my companions carefully concealed their envy! JRs tactical power nap would also have worked a treat if when he woke up he was sitting on the French side of la Manche and not still in bloody Folkestone! Eventually we were told we need to de-train due to technical problems and then go from there, so we were led on a slow congo around the terminal and onto the replacement train. And continued waiting. It turned out another train was stuck in the tunnel. Which means on top of a broken service in the summer we were again experiencing not one but two broken trains. This does make you wonder about the effectiveness of their maintenance spend. Finally, three and a half hours after our scheduled departure, all of which had been spent sitting in or around our cars in a glorified freight train, we were underway. The delay wasn’t the only thing jeopardising our plans but it did make a big difference to the way the day panned out. The other major factor influencing the day was the weather. As the week had progressed it was clear that we wouldn’t be riding in the crisp but comfortable sunlight of a fine autumnal day. The weather systems were looking rather problematic, with high winds at times, rain predicted and a biblical deluge on Sunday. 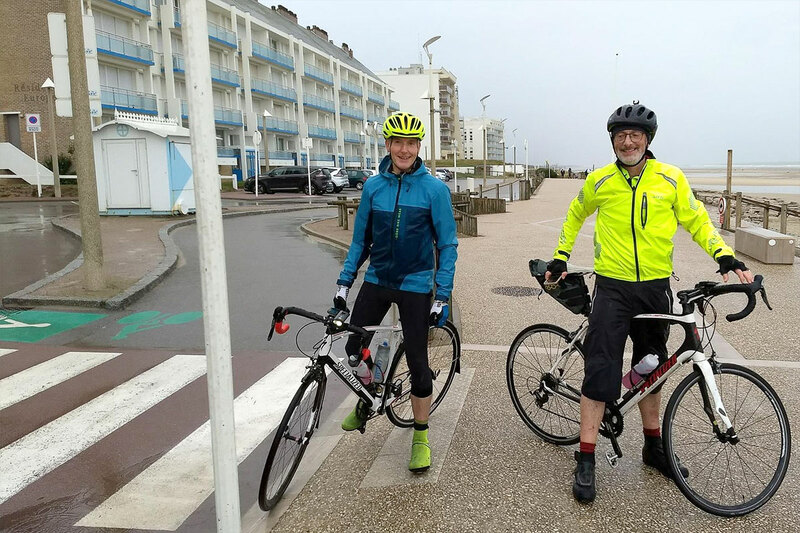 Saturday too, as we neared the day was also expected to be growing increasingly wet but with a relatively dry morning the expectation was we’d have 70 miles under our wheels by the time we stopped for lunch at Montreuil. The Eurotunnel delay threw all of that out of the window. We missed the first few dry hours and got going in damp patchy conditions that very quickly turned into persistent rain as we started climbing the first hills. Within a couple of miles my route had us climbing a steady 6% grade for a mile or so, a nice warm up that coincided with the first squalls of proper rain. I had taken the trouble to fit my mudguards the night before and Ian too had mudguards but JR and Mark didn’t. I have always said that the wettest it’s possible to be on any bike is riding a road bike in heavy rain without mudguards; it’s far, far worse than anything you are likely to experience on a MTB. Basically, you sit there for mile after mile while heavy rain falls on you from above while at the same time the water that has already fallen and collected into puddles is also thrown at you from below. It’s miserable. When the temperatures are hovering around 7°C as well, this makes for an uncomfortable experience. It wasn’t long before we were very wet and pretty cold as our relatively sedate pace worked against us. As with last year we started counting barking dogs and got to five (plus a startled chicken at Sehen), before even the animals appeared to retire to somewhere warm and dry for the day. It was only us out there. 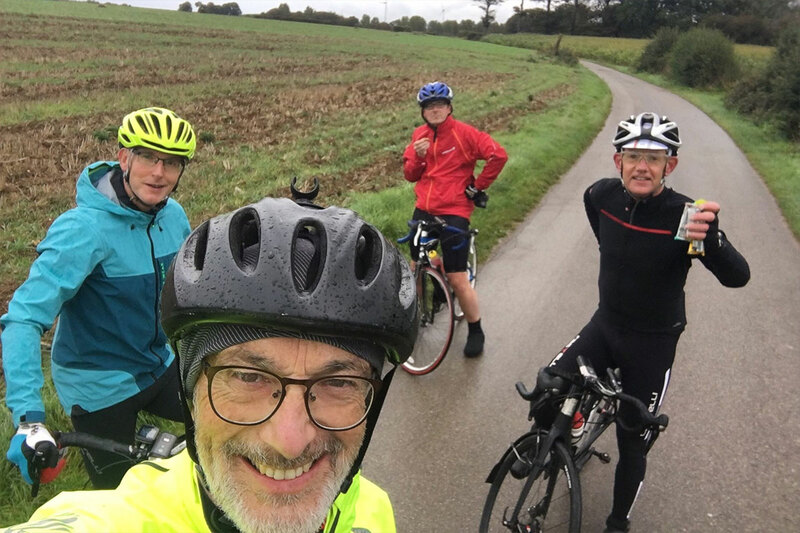 Sharp hills were interspersed with long stretches of downhill and the rain was sporadic – heavy showers with brief pauses in between, but permanently wet roads. And the weather was not improving. After less than 20 miles and some long downhills that drove needles of water stinging into our squinting faces we needed to make some difficult choices. 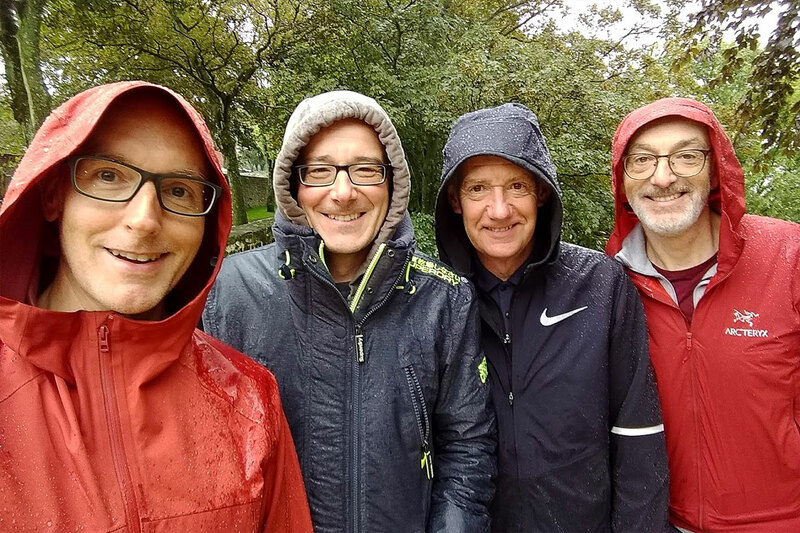 JR was wearing waterproof shorts, and Ian and I had long tights, but Mark must have been feeling quite uncomfortable in the sodden bibshorts he was wearing. The rain was set in now and there was no immediate prospect of it getting any drier either. In view of the local time having passed 1:15 I made the decision to head directly to Montreuil, where I knew we could get lunch rather than waste time on the 30+ mile leg out to Hesdin. There’s no lunch if you are late in France after all and we needed to think about our options. Fortunately my route planning had anticipated this. Although the plan was to loop out and beyond Hesdin to the east, the return leg came within half a mile of the start of the outward leg and it was a simple matter to bridge this and head directly into Montreuil. The slick and shiny pave was a nerve-wracking half mile to negotiate, but the reward was the market square and a rather nice lunch. What a relief it was to get out of the cold and wet and into the warm gloom of la Paloma restaurant. A round of Leffe was quickly ordered, followed by a restorative meal of Croque Madame and frites for me. After a cafe creme and hour or so in the warm, things were looking a little better. There was no way round the fact that to get back to the cars we needed to ride. A direct return would have been about 20 miles straight north, whereas it was still possible for us to attempt at least a truncated version of the final third of our original route out toward Hardelot Plage. At this point, things were marginally brighter and we remained in good spirits so we decided to go and visit the seaside. In for a penny and all that. I’m glad we did. I really was not keen to face defeat so early in the day, so off we went heading north west into light but steady winds. It wasn’t long before the rain resumed but by then we were resigned to it. 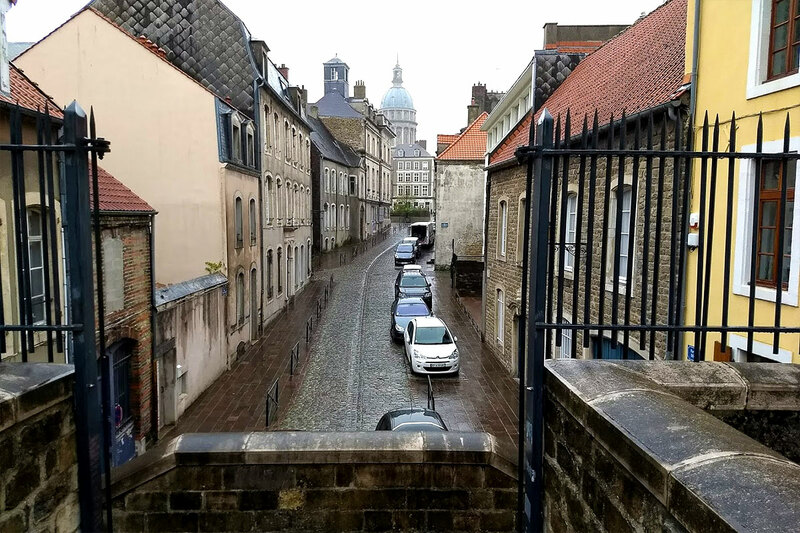 There are a couple of long, long draggy climbs between Montreuil and Hardelot but we just needed to grit them out and get the job done as the rain continued to fall. Eventually we reached Hardelot, which offers a sharp contrast to the rural landscape we had been riding through for most of the day. Hardelot an affluent holiday town set in a broad swathe of coniferous forest, and the scent of pine is everywhere and quite striking. The houses are large and comfortable and unusually for France are not yellow stone with blue or olive windows! They are quite twee, in a Stepford way, but at least they are different. By now we were all feeling pretty cold (I can only imagine what Mark was feeling like) and the rain was coming down more and more heavily. This was definitely NOT a clearing shower! We reached the beach and stopped for wet pictures, stuffing down snacks in the lea of a building on the sea front. I’d love to come back here in better weather and spend a day on the beach which is long and sandy with a gently shelving shoreline. I haven’t yet seen it in temperatures above 12°C and certainly didn’t this time round. Still, the wind – such as it was – now blew from behind us which was a psychological lift if nothing else. I decided reluctantly that it was time to truncate the route again and follow the same route back as last year. 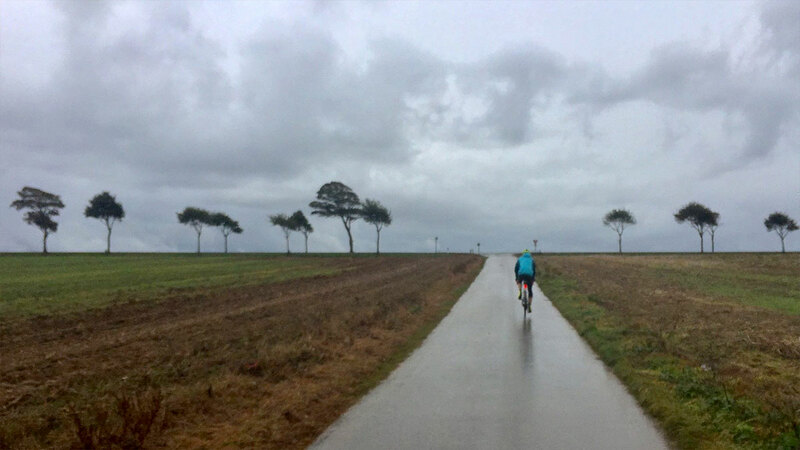 I had been planning to add another five to ten miles to the return leg to bring us back to the cars at Desvres, but time was getting on and the weather wasn’t letting up. So we left the village along the north road, passing the 13th century Chateau Hardelot as we threaded our way between the fortifed ruin and the wooded shore of the Lac des Miroirs. Then it was out through neat rows of houses and back over the A16 autoroute. It was grey and gloomy as the afternoon wore on but we still had a while before sunset. Our spirits were lifted as we span through Carly by a newly married bride and groom driving through the town ahead of us hooting their car horn continuously as they made their way to their reception. It must be a tradition because loads of cars were hooting back – all very noisy. It did take our minds off the hills, at least for a short while. There’s a drag up to Samer, then out of Samer a rider can find himself passing through Longfosse three times without actually retracing their steps, such are the way the road signs are laid out. It could just be a hallucination induced by the final sharp climbs up into Desvres. Returning back to the car was a huge relief, and once again it was an absolute pleasure to make use of my much envied Modesty Smock™. What was even nicer was to start the car without issue, unlike the year before. After changing clothes and loading up the cars it was then an easy 12 mile drive straight into Boulogne. We stayed in the Ibis next to the Cathedral outside Porte Nueve, leaving the cars in the free public car park opposite but locking our bikes in the secure area of the hotel. It was an ideal arrangement and the rooms were on a par with a simple Travelodge over here, even if they were rather small. A quick freshen up saw us meeting back in reception soon after before stepping out into the dark of the night and rain that really hadn’t let up all day. By this time we couldn’t care less; we had just about 60 miles completed and the only task ahead of us was to drink beer, drink wine and eat. We soon fell into a welcoming restaurant and had a very enjoyable meal in the warm and dry. I’d have enjoyed lunch, dinner, and the company … and that’s about it ! Sounds miserable, yet oddly I see smiling faces, maybe you found some French mushrooms along the route? Looking forward to reading next years instalment! As Sherlock Holmes would say ‘the game’s afoot’! I have a plan to do this route with a different start point in the Spring. It might have been wet but was very good-natured, largely because if you have a large lunch and can look forward to a few beers in the evening things can’t be that bad! Yes, I’m already looking forwards to reading the next chapter! Well done for the idea and incredible perseverance.